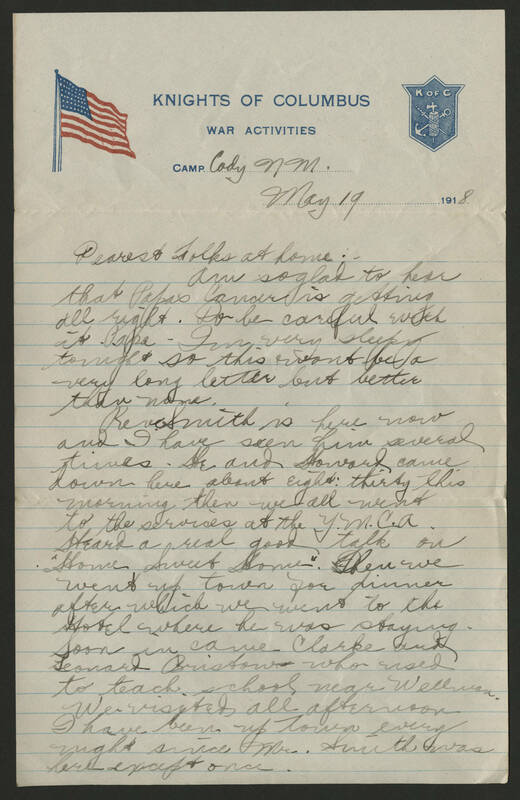 Camp Cody NM May 19 1918 Dearest Folks at home: Am so glad to hear that Papa's cancer is getting all right. Do be careful with it Papa. Im very sleepy tonight so this wont be a very long letter but better than none. Rev. Smith is here now and I have seen him several times. He and Howard came down here about eight:thirty this morning then we all went to the services at the Y.M.C.A. Heard a real good talk on "Home Sweet Home". Then we went up town for dinner after which we went to the Hotel where he was staying. Soon in came Clarke and Leonard Bristow who used to teach school near Wellman. We visited all afternoon. I have been up town every night since Mr. Smith was here except once.